Ground blizzards are possible in a good portion of Minnesota Thursday into Friday. Be prepared for bitterly cold temps. Wind chills are expected to be between -20 and -40 on Thursday into Friday as a artic air enters the viewing area. 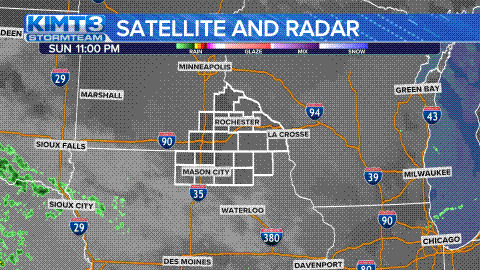 Because of that, ground blizzards are possible in a good portion of Minnesota with gusts around 35-40 miles per hour and a Winter Storm Watch has been issued for Freeborn and Faribault County. Parts of Minnesota already have a Blizzard Warning in place. By 7 p.m. Thursday, wind chills are expected to be near -30 degrees and could drop even more overnight. * WHAT...Blizzard conditions possible. Winds could gust as high as 45 mph. * WHERE...Portions of central, south central and southwest Minnesota. * WHEN...From late Wednesday night through Thursday morning. * ADDITIONAL DETAILS...Plan on slippery road conditions. Patchy blowing snow could significantly reduce visibility. The hazardous conditions could impact the morning commute. The cold wind chills as low as 30 below zero could cause frostbite on exposed skin in as little as 30 minutes. A Winter Storm Watch for blizzard conditions means there is a potential for blowing snow with strong winds and extremely poor visibilities. This can lead to whiteout conditions and make travel very dangerous.